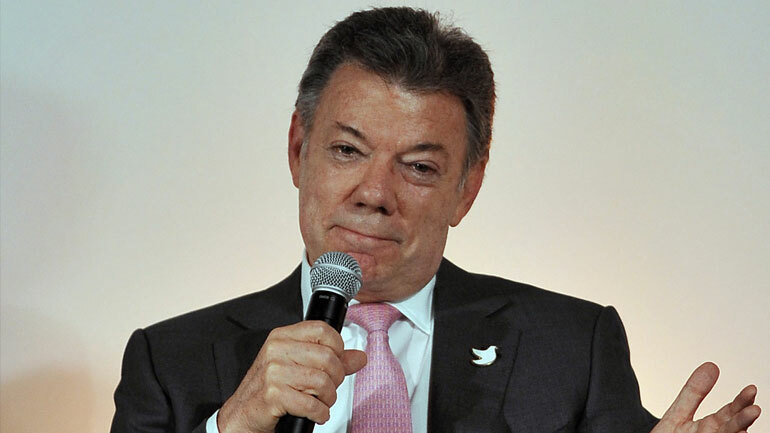 A day after paramilitary successor group Los Urabeños ended their shut-down of the north of Colombia and parts of Medellin, President Juan Manuel Santos told Colombians to not be intimidated by illegal armed groups. A dozen assassinated policemen and a few hundred printed copies of the order was enough for the Urabeños to shut down the Caribbean and Pacific coasts, and Colombia’s second largest city of Medellin. While the north and west of Colombia turned into a ghost regions and the millions living in those areas were not even allowed to buy rice, President Juan Manuel Santos was mainly absent. The president did appear on Friday in Monteria, one of the cities most affected by the compulsory shut-down, promising “we are going to finish with” the Urabeños, but few believed him and nothing happened. As soon as Santos left the city, Monteria went on a neo-paramilitary lock-down again, leaving the security forces and the national government look powerless. It wasn’t until Saturday, when the Urabeños explicitly lifted the strike, public life resumed. “Together we will defeat these criminals,” the president stated boldly. However, these words couldn’t have sounded more meaningless. The security forces have deployed more than 1,500 extra forces in Urabeños territory since over a year ago, but with little success. During the paramilitary shut-down, “the National Police has arrested 59 delinquents of this criminal organization” estimated to have some 3,000 men in arms. While calling for the strike, the Urabeños also called for their inclusion in ongoing peace talks with left-wing FARC and ELN rebels, the old arch enemies of the AUC, the now-defunct paramilitary organization from which the Urabeños were formed. While the government insists the group are nothing but drug trafficking criminals, the Urabeños consider themselves a continuation of the paramilitary forces that helped the state combat guerrillas until the AUC’s demobilization between 2003 and 2006. The group’s commanders are all former AUC members who refused to demobilize after peace talks with the administration of former President Alvaro Uribe. The group is only one of half a dozen groups that were founded by dissident AUC members during and after the paramilitaries’ demobilization.